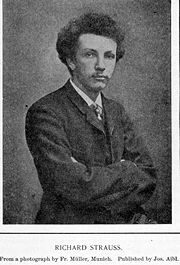 Richard Strauss (June 11, 1864 – September 8, 1949) was a German composer of the late Romantic era, particularly noted for his tone poems and operas. He was also a highly regarded music conductor. In an interview with American journalist Arthur M. Abell, Strauss disclosed that he had read the work of the Swedish mystic Emmanuel Swedenborg and that this prompted a curiosity about the reality of spiritual world vis-a-vis his creative process. In speaking about the libretto that served as the basis for his tone poem Death and Transfiguration, Strauss confided that he identified with the hero of the work in that in he expects to have the frustration of his earthly dreams realized upon "the triumphant opening of the gates of Heaven." In the discourse with Abell as to what heaven may be, Strauss refers to Swedenborg, who "claimed that he could actually look into Heaven, and that he found it to be a glorified earth, where we carry on and perfect the work we start here [on earth.] I believe that." Referring to the source of creative inspiration, he offered, "I realize that the ability to have such ideas register in my consciousness is a Divine gift. It is a mandate from God, a charge entrusted to my keeping, and I feel that my highest duty is to make the most of this gift—to grow and to expand." He was born on June 11, 1864, in Munich (then in the Kingdom of Bavaria, now in Germany), the son of Franz Strauss, who was the principal horn player at the Court Opera in Munich. He received a thorough, but conservative, musical education from his father in his youth, writing his first music at the age of six. He continued to write music almost until his death. During his boyhood he had the good fortune of attending orchestra rehearsals of the Munich Court Orchestra, and he also received private instruction in music theory and orchestration from an assistant conductor there. 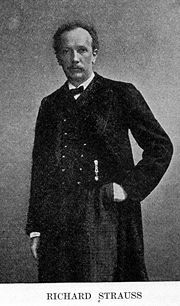 In 1874 Strauss heard his first Wagner operas, Lohengrin, Tannhäuser, and Siegfried; the influence of Wagner's music on Strauss's style was to be profound, but at first his father forbade him to study it: It was not until the age of 16 that he was able to obtain a score of Tristan und Isolde. Indeed, in the Strauss household the music of Richard Wagner was considered inferior. Later in life, Richard Strauss said and wrote that he deeply regretted this. In 1882, he entered Munich University, where he studied philosophy and art history—not music—however, he left a year later to go to Berlin. There he studied briefly before securing a post as assistant conductor to Hans von Bülow, taking over from him at Munich when he resigned in 1885. His compositions around this time were quite conservative, in the style of Robert Schumann or Felix Mendelssohn, true to his father's teachings. His "Horn Concerto No. 1" (1882–1883) is representative of this period and is still regularly played. Strauss's style began to change when he met Alexander Ritter, a noted composer and violinist, and the husband of one of Richard Wagner's nieces. It was Ritter who persuaded Strauss to abandon the conservative style of his youth, and begin writing tone poems; he also introduced Strauss to the essays of Richard Wagner and the writings of Schopenhauer. Strauss went on to conduct one of Ritter's operas, and later Ritter wrote a poem based on Strauss's own Tod und Verklärung. Richard Strauss married soprano singer Pauline Maria de Ahna on September 10, 1894. She was well known as being bossy, ill-tempered, eccentric, and outspoken, but the marriage was happy, and she was a great source of inspiration to him. Throughout his life, from his earliest songs to the final "Four Last Songs" of 1948, he always preferred the soprano voice above all others. This newly found interest resulted in what is widely regarded as Strauss' first piece to show his mature personality, the tone poem Don Juan. When this was premiered in 1889, half of the audience cheered while the other half booed. Strauss knew he had found his own musical voice, saying "I now comfort myself with the knowledge that I am on the road I want to take, fully conscious that there never has been an artist not considered crazy by thousands of his fellow men." Strauss went on to write a series of other tone poems, including Aus Italien (1886), Tod und Verklärung (Death and Transfiguration, 1888–1889), Till Eulenspiegels lustige Streiche (Till Eulenspiegel's Merry Pranks, 1894–95), Also sprach Zarathustra (Thus Spoke Zarathustra, 1896, the opening section of which is well known for its use in Stanley Kubrick's film 2001: A Space Odyssey), Don Quixote (1897), Ein Heldenleben (A Hero's Life, 1897–98), Sinfonia Domestica (Domestic Symphony, 1902–03), and Eine Alpensinfonie (An Alpine Symphony, 1911–1915). Around the end of the nineteenth century, Strauss turned his attention to opera. His first two attempts in the genre, Guntram in 1894 and Feuersnot in 1901, were critical failures. However, in 1905, he produced Salome (based on the play by Oscar Wilde), and the reaction was as passionate and extreme as it had been with Don Juan. When it opened at the Metropolitan Opera in New York City, there was such a public outcry that it was closed after just one performance. Doubtless, much of this was due to the subject matter, and negative publicity about Wilde's "immoral" behavior. However, some of the negative reactions may have stemmed from Strauss's use of dissonance, rarely heard then at the opera house. Elsewhere the opera was highly successful and Strauss financed his house in Garmisch-Partenkirchen completely from the revenues generated by the opera. Strauss' next opera was Elektra, which took his use of dissonance even further. It was also the first opera in which Strauss collaborated with the poet Hugo von Hofmannsthal. The two would work together on numerous other occasions. For these later works, however, Strauss moderated his harmonic language somewhat, with the result that works such as Der Rosenkavalier (The Knight of the Rose, 1910) were great public successes. Strauss continued to produce operas at regular intervals until 1940. These included Ariadne auf Naxos (1912), Die Frau ohne Schatten (1918), Intermezzo (1923), Die ägyptische Helena (1927), and Arabella (1932), all in collaboration with Hofmannsthal; and Die schweigsame Frau (1934), with Stefan Zweig as librettist; Friedenstag (1936) and Daphne (1937) (libretto by Joseph Gregor and Zweig); Die Liebe der Danae (1940) (with Gregor) and Capriccio (libretto by Clemens Krauss) (1941). Strauss's solo and chamber works include early compositions for piano solo in a conservative harmonic style, many of which are lost; a rarely-heard string quartet (opus 2); the famous violin Sonata in E flat, which he wrote in 1887; as well as a handful of late pieces. There are only six works in his entire output dating from after 1900 which are for chamber ensembles, and four are arrangements of portions of his operas. His last chamber work, an Allegretto in E for violin and piano, dates from 1940. Much more extensive was his output of works for solo instrument or instruments with orchestra. The most famous include two horn concerti which are still part of the standard repertoire of most french horn soloists, a concerto for violin, Burleske for Piano and Orchestra, the tone poem Don Quixote, for cello, viola, and orchestra, a late Oboe Concerto (inspired by a request from an American soldier and oboist, John DeLancie, whom Strauss met after the war), and the duet concertino for bassoon and clarinet, which was one of his last works (1947). Strauss admitted that the duet concertino had an extra-musical "plot," in which the clarinet represented a princess and the bassoon a bear; when the two dance together, the bear transforms into a prince. There is much controversy surrounding Strauss' role in Germany after the Nazi Party came to power. Some say that he was constantly apolitical, and never cooperated with the Nazis completely. Others point out that he was an official of the Third Reich. Several noted musicians disapproved of his conduct while the Nazis were in power, among them the conductor Arturo Toscanini, who famously said, "To Strauss the composer I take off my hat; to Strauss the man I put it back on again." It is important to note that at the time of the Nazi ascendancy, Strauss was in his 70s and was no longer considered Germany's most preeminent composer; that distinction belonging to Paul Hindemith. As former New York Times music editor, Harold C. Schonberg put it, Strauss would say things that would have meant being sent to a concentration camp had he not been the icon he was and the Nazi's simply "did not know exactly what to do with him." In November 1933, without any consultation with Strauss, Joseph Goebbels appointed him to the post of president of the Reichsmusikkammer, the State Music Bureau. Strauss decided to keep his post but to remain apolitical, a decision which has been criticized as naïve, but perhaps the most sensible one considering the circumstances. While in this position he wrote and conducted the Olympic Hymn for the 1936 Olympic Games, and also befriended some highly-ranked Nazis. Evidently his intent was to protect his daughter-in-law Alice, who was Jewish, from persecution. In 1935, Strauss was forced to resign his position as Reichsmusikkammer president, after refusing to remove from the playbill for Die schweigsame Frau the name of the Jewish librettist, his friend Stefan Zweig. He had written Zweig a supportive letter, insulting to the Nazis, which was intercepted by the Gestapo. Strauss completed the composition of Metamorphosen, a work for 23 solo strings, in 1945. The piece mourned the destruction of Germany wrought by World War II, but also encouraged the continued examination of Strauss's sympathy for Nazi Germany. It is now generally accepted that Metamorphosen was composed, specifically, to mourn the bombing of Strauss's favorite opera house; and generally, to reflect on the damage caused by the war to the German culture and aesthetic. He was eventually tried, and absolved of any Nazi ties or affiliations. In 1948, Strauss wrote his last work, Vier letzte Lieder (Four Last Songs) for soprano and orchestra, reportedly with Kirsten Flagstad in mind. She certainly gave the first performance (live) and it was recorded, but the quality is poor. It is available as an historic CD release for enthusiasts. All his life he had produced lieder, but these are among his best known (alongside Zueignung, Cäcilie, Morgen, and Allerseelen). When compared to the work of younger composers, Strauss' harmonic and melodic language was looking somewhat old-fashioned by this time. Nevertheless, the songs have always been popular with audiences and performers. Strauss himself declared in 1947, "I may not be a first-rate composer, but I am a first-class second-rate composer!" 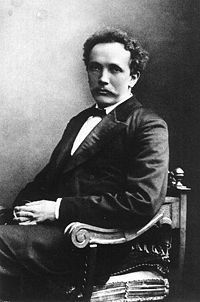 Richard Strauss died on September 8, 1949, in Garmisch-Partenkirchen, Germany at the age of 85. Gilliam, Bryan. "Richard Strauss." Retrieved August 31, 2007. Public Domain Sheet Music of Richard Strauss at IMSLP. This page was last modified on 11 July 2015, at 22:46.